In life, the saying goes, there are no second acts. Enter Shelley Page. 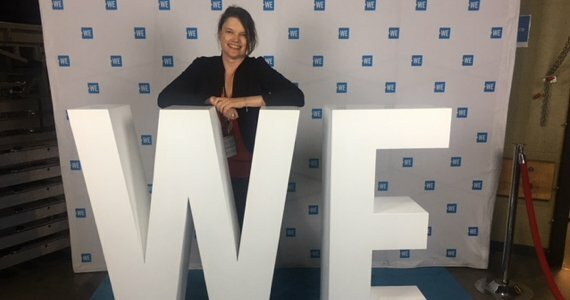 Shelley found early success in her career as a journalist—but it’s in her second act, with WE, that’s she’s found new meaning as an advocate and mentor. Shelley likes to tell her team of writers, editors and videographers to start interviews with people, whether famous or not, at the beginning so you can figure out their journey. And when you tell their story, find the narrative engine that propels the story forward, taking the audience with you. Shelley’s story begins in the newsrooms of the Toronto Star and Ottawa Citizen as a reporter, science writer and columnist, covering social and political issues. After 12 years—and with a shelf full of accolades—she became the Ottawa Citizen’s lead features writer. Her first long-form piece told the story of a prominent Ottawa-area family who’d been brought up Catholic after their Jewish ancestors escaped the Holocaust; the 12,000-word epic tale brought the Jewish and Catholic communities in Ottawa together and showed Shelley the power of narrative to move people. Over the course of her career, Shelley’s features earned her three National Newspaper Awards, Canada’s top print journalism prize. But it was a story she pitched on child labor in 2002 that changed her life, and would impact WE. Craig Kielburger had burst into the Canadian consciousness seven years earlier as a strident teen holding then Prime Minister Jean Chrétien to account on issues of child labor. Shelley wanted to know what he’d been doing in the intervening years. She met him at his parent’s former Thornhill home—then still acting as WE’s headquarters—and a week later traveled with him to rural China for the opening of a new school. On that trip, and another two years later to Kenya with WE co-founders Marc Kielburger and Roxanne Joyal, she saw a tireless group of young people with a vision and ambition to change the world. She got a sense of the holistic development model and the impact it can have. And she began to dream of using her skills as a storyteller to move people to give back. Shelley continued as a features writer while acting as an editor to Craig and Marc’s New York Times bestseller, ME to WE: Finding Meaning in a Material World, and co-authoring The World Needs Your Kid: How to Raise Children Who Care and Contribute. In 2012, she joined WE full-time to direct the content strategy and strategic communications. WE caught up with her to talk about how the organization won over her natural journalistic critical gaze, the power of stories and the intangibles that WE offers. It’s twofold, really. First, I really believe in helping the young people I get to work with every day do their best work, fulfill their purpose and develop a career path. That means a lot to me. I’ve already had a great career path, if I can help others find theirs, too, as a mentor and coach, I really want to do that for them. My other ‘why’ is that I am as a storyteller, it’s the essence of who I am. I want to help WE tell its best stories so other people can come to know us, to appreciate our impact, as I do. Why do you believe in storytelling? People aren’t moved by facts—they’re moved by stories. They’re moved by the journey people take overcoming challenges, traversing from a low point to a high point. That is what WE helps people do, to make that journey, to better themselves. Whether it’s with tools, inspiration or development know-how—WE assists people to make something better in the world, no matter the challenges. When I started working here, I saw the breadth and depth of our programming, both domestically with WE Schools and in our partner communities, with WE Villages. I began to see that every day we’re making incredible things happen. But we weren’t telling those stories well or very often. These amazing, impactful, transformational stories are our best proof of the change we’re creating. I believed if we had a storytelling platform to share this impact, it would help get more people involved. That’s why WE made an investment in storytelling and in strategy and enabled my team to launch WE Stories (WE.org/stories). We interview youth and educators at our WE Schools programs in Canada, the U.S. and UK And we often spread out to our WE Villages communities—Ecuador, Kenya, India and Haiti, among others—to tell stories of the people we work alongside. It’s inspiring. This isn’t typically what a nonprofit does. We’re producing people’s daily dose of WE. In addition—and this is a game changer in this space—our stories are also the proof of impact for people who purchase ME to WE products with a Track Your Impact code. These products have a direct benefit in the communities where WE works, and we document that impact through our stories. How is working at WE different from your experience in the newsroom? I find it really satisfying to help people become better at what they are passionate about. I taught journalism at Carleton University School of Journalism and was also a writing coach at the Ottawa Citizen for many years. This was hugely fulfilling to me. The cool thing about WE is that we hire many recent graduates or those very early in their careers and give them a lot of responsibility so they can test themselves. I like helping them be their best. And even though this a second career for me, I wanted to take all my storytelling abilities, all my strategic thinking and passion for mentoring young people, and put it to use giving back. What has made WE a great place for you to work. Throughout my career, I always tried to balance a very demanding job with the reality of having a serious chronic illness. It has not always been easy and there have been many low points. But I will always be grateful to Craig and Marc. Without hesitation, when my health challenges left me unsure I could be a journalist, they offered me a lifeline to find a new passion. I’m also grateful that increasingly, WE has recruited other seasoned professionals who are also on their second act to mentor and lead the young keeners I’m surrounded by. Being at WE has also been a learning experience for me. Far more than I expected. That’s the thing about second acts. You never know what will happen. I’m surrounded by a world-class team of experts. Our heads of Internal and External Communications, Head of Integrated Marketing, Head of Creative and Head of New Media are the best in the business. We’re working together to tell even more stories, about our impacts, products and experiences. We also now have the WE Global Learning Center which allows us to share these stories with the world in an incredibly powerful way because of the investment in technology and the donated support of Cisco, TELUS, Siemens and Microsoft. It’s all so exciting and I can’t think of a better place to learn, mentor and make an impact.